For many, the backyard patio sets the stage for warm weather entertaining. From relaxing by the pool to having guests over for a summer BBQ, choosing the perfect outdoor patio furniture can make the experience one to remember. Your deck and patio furniture should create a comfortable atmosphere, while utilizing your outdoor space. This guide will help you choose the outdoor dining furniture that best suits your outdoor area, and makes the most of your backyard oasis. Outdoor Dining Tables: These tables are perfect for enjoying dinner outside. A large oval or rectangular patio dining table is great for entertaining big groups while smaller dining tables can comfortably seat up to four people. Café Tables: If you have a small area, an outdoor coffee table or side table will make a great accent piece and pull the space together. Picnic Tables: With their bench seating, picnic tables provide a casual outdoor dining experience. And when backyard space is hard to come by, a folding picnic table allows you to set it up when you need it and stow it away when you don’t. Adirondack Chairs: Adirondack chairs are synonymous with outdoor relaxation. Whether on the front porch or in the yard, nothing can beat an Adirondack chair for its classic sense of style and comfort. Outdoor Rocking Chairs: Another classic piece of outdoor furniture is the porch rocking chair. Few things compare to rocking the day away in a wooden rocking chair. 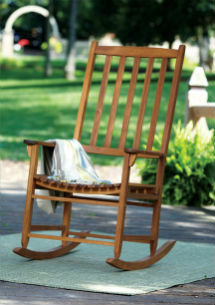 Outdoor rocking chairs are sure to bring you years of peace and enjoyment. Outdoor Lounge Chairs: An outdoor chaise lounge is the perfect place to lay back and enjoy your time by the pool. If you are traveling to the beach, a folding or plastic lounge chair offers you a place to relax wherever you go. Outdoor Dining Chairs: No outdoor dining area is complete without chairs. Enjoy your family dinner in comfort with a sling patio chair or have a seat at the backyard bar on an outdoor bar stool. If space is tight, bistro chairs are a stylish compact solution. Hanging porch swings: Hanging porch swings can be installed on nearly any porch. Because they install on the porch ceiling, these porch swings automatically provide an element of shelter. Yard Swings: Yard swings are a great solution if you don’t have a porch, as they have a frame and are able to be set up in any available space. Many yard swings have canopies for additional comfort and protection from the sun. Gliders: Gliders are similar to outdoor swings and provide a smoother motion. 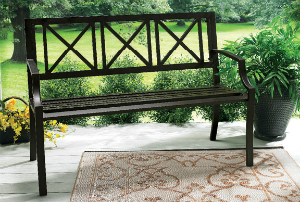 A two seat glider will add a romantic touch to your patio setting. Hammocks help transform your patio into a living area and are the ultimate symbol of backyard relaxation. Before expanding your outdoor furniture collection, there are a few styles of hammocks to consider. A cotton rope hammock is perfect for the classic style of tying your hammock between two trees, while a portable hammock allows you the ability to set up and relax wherever you go. If you are going on a trip, bring along folding hammock stands to have a place to lounge while on vacation. 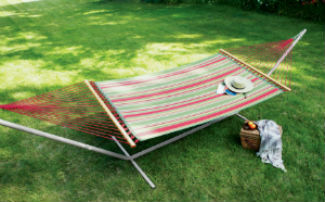 The addition of a hammock to your patio furniture set is essential to easy, simple living. A bistro set adds a sophisticated look to your outdoor dining experience, and is an ideal option for areas short on space. The many styles of bistro sets available make it easy to complement your personal preference. If you are going for more of a traditional look, then wrought-iron bistro sets are a good fit. Wicker bistro sets are better suited for classic outdoor tastes, while the clean lines of a wooden bistro set establish a warm, modern feel. When you’re ready to do some serious entertaining, outdoor bar sets are great for hosting parties around the pool and a tiki bar is the ultimate addition for any warm-weather gathering. When looking to purchase everything at once, a complete outdoor dining set is the best choice. A patio dining set will generally include a table and chairs and sometimes even other accent pieces like an umbrella, designed to fit together. 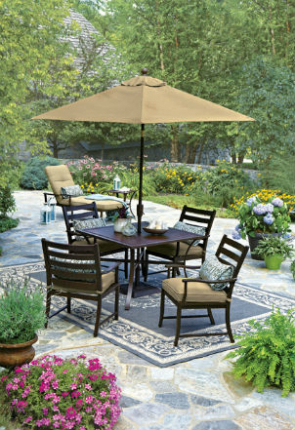 Patio sets are an excellent choice thanks to their ability to be customized. From an outdoor summer cook-out to a low-key family breakfast, outdoor dining sets give you the freedom to choose the pieces that best fit your needs. Not all yards and patios are perfectly shaded and being in direct sunlight can be a nuisance for anyone. Patio umbrellas offer protection from the sun and comfort for you and your outdoor guests. A functional addition to your backyard space, outdoor umbrellas come in many shapes, sizes and styles. A classic market umbrella is perfect for smaller areas, while a large rectangular patio umbrella accommodates larger spaces. Because the sun doesn’t stay in one spot, tilting patio umbrellas enable you stay in the shade throughout the day. Whether your umbrella is free-standing or used with a table, an outdoor umbrella base is essential to keeping it anchored. Umbrella bases come in a wide variety of designs and add style while stabilizing the umbrella. 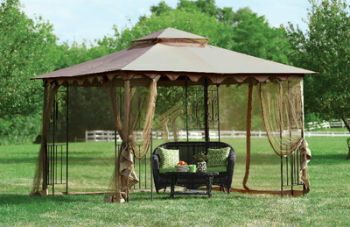 Gazebos can carve out a nice backyard getaway. Whether you are hosting a group of people for a picnic or just having a quiet cup of coffee, a gazebo provides shelter, letting you enjoy your time outside rain or shine. Sitting on a park bench, enjoying the day is one of life’s simple pleasures. Outdoor garden benches offer a quiet escape to read a book or relax after a long day. Park benches are made many materials, such as wood, steel and iron to reflect your personal style. Patio furniture withstands a decent amount of weathering over time. Replacing your old outdoor furniture cushions is necessary in order to keep your collection in good condition. With many styles of outdoor furniture cushions on the market, cushion sets that repel water and are stain resistant are a good low maintenance choice. Updating your patio chair cushions is also an easy way to get a fresh look from your existing outdoor furniture set. An outdoor furniture set is an investment that needs to be protected. Outdoor furniture covers come in every shape and size to protect all your patio furniture; from tables and chairs to chaise lounges and even full sets, covering your outdoor furniture will help you get the most longevity for your money. Wood: The natural beauty of wooden outdoor furniture fits well in nearly any outdoor patio setting. It is a classic, low maintenance material that is durable and will last for years with the proper care. Teak: Teak is a dense and durable hardwood that doesn’t require much maintenance. It is an excellent choice for patio furniture in areas with dramatic temperature changes because it is warp resistant and repels water. Although teak outdoor furniture can be more expensive than other woods, its resilience makes it one of the better choices for your patio set. Metal: Metal patio furniture comes in three standard materials: aluminum, steel and iron. Aluminum is a lightweight, rust-resistant metal requiring little maintenance. Many people prefer aluminum for their outdoor garden furniture. Steel tends to be heavier and is considered one of the most durable outdoor furniture materials. More durable, but even heavier than steel, wrought-iron patio furniture is a popular choice for formal or classic outdoor settings. Wicker: Wicker is a natural material that is versatile and lightweight. Outdoor wicker furniture is made from many different materials such as rattan and bamboo. Wicker is one of the most popular styles of outdoor furniture because of its strength, durability and high level of comfort. Analyze and Measure Your Space: Survey your empty outdoor space and envision what it will be used for. Remember that a smaller space may not be suitable for a full outdoor dining set in which case a bistro table and chair set may be more appropriate. The size and shape of your outdoor space should determine the size of your outdoor furniture. When deciding where to place your patio furniture, make sure to leave enough space to move around them easily. Find Your Style: Think about the elements that reflect your personal style best. If you appreciate Victorian decor, then consider shopping for wrought iron furniture. Wood and wicker work better for more casual tastes. Remember accent pieces, like side tables and patio umbrellas, to tie the space together. Don’t Forget About Comfort: When choosing your outdoor furniture, remember the main goal is to create a space to relax. As a general rule of thumb, your outdoor furniture should be durable enough to weather the elements and comfortable enough to make you want to stay seated for a while. Your outdoor furniture should be an extension of your home. Choosing the correct patio furniture styles and materials is essential to creating an inviting and relaxing outdoor space. When purchasing patio furniture, making an educated choice can help you enjoy your favorite pieces for years to come.